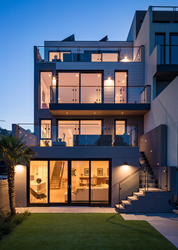 Ultra-luxury and ultra-efficiency go hand-in-hand with the just-introduced Passive House at 2127 Castro in the heart of Noe Valley. Engineered to rigorous European Passivhaus standards, the chic home’s airtight construction delivers up to a 90% reduction in energy use along with utter quiet and vastly improved air quality. “No other home on the San Francisco market could pass the tests required at all phases of construction for Passive House certification in the U.S. [PHIUS],” says the builder, Ewen Utting of ENU Construction. The home is so tightly sealed and highly insulated that it is actually heated by the ambient heat of the home’s appliances, lighting and the body heat of its occupants. At the heart of the home’s construction is the Heat Recovery Ventilation (HRV) system that filters out pollens and pollutants and exchanges them for fresh air 24 hours a day. Net-Zero and then some. A Net-Zero house is one that relies on renewable sources to replace the energy it uses. The 18 solar panels and solar water heater at 2127 Castro more than replace the energy the house consumes. Under California’s aggressive new Title 24 building code all residential housing must meet Net-Zero standards by 2020. The 4-bedroom, 4.5-bath residence, appointed with Miele appliances and WinkHaus fixtures is a collaboration between Hood Thomas Architects, Ewen Utting of ENU Construction and Graham Irwin of Essential Habitat. The home is offered by Pete Brannigan of the Paragon Real Estate Group. A second 4-bed, 4.5-bath Passive House at 2123 Castro will be offered shortly. In One City: Built to Last, New York City Mayor Bill De Blasio’s 35-year plan for reducing greenhouse gas emissions, Passive House construction is the only building standard named as a pathway for achieving the city’s goal of an 80 percent emissions reduction.